Congratulations! You have now reached your due date. The chances are that if you have time to read this then your little one hasn't yet arrived. Remember that your due date is known officially as your "estimated due date" and, in fact, only around 5% of babies arrive on this date. Your pregnancy is considered to be full term between 37 and 42 weeks and most babies do arrive during this period. Average baby weights when delivered at full term vary considerably, but you can expect your baby to weigh somewhere in the region of 2.7-4kg, and measure between 48 and 56cm long. You may be having concerns about your waters breaking in a public or embarrassing place. Film and television soap writers like to portray women's waters breaking in supermarkets, at dinner parties or in the high street, and let's face it, it makes for a more interesting story than having them broken by your midwife in the more discreet environment of a hospital room. However, back in the real world the story rarely goes that way, so if you've heard an urban myth about getting free nappies for life if your waters break in your local supermarket you are probably wasting your time loitering there! Firstly, let's look at the statistics: in excess of 85% of women actually find that their membranes rupture (which is what starts the leaking of amniotic fluid) in the hospital. This is either naturally or started manually by a midwife. Secondly, let's dispel the idea of litres of gushing liquid soaking your clothes and flooding the floor of the post office - or wherever it is you fear it may happen. 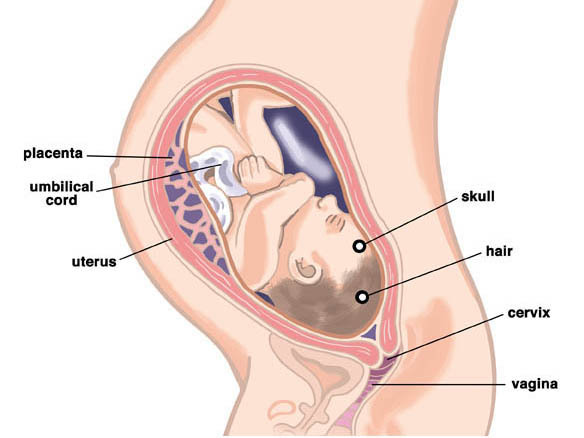 While some women do experience a greater amount of fluid loss than others, the rate of this loss is lessened considerably (to more of a trickle) when the woman is upright, because effectively the baby's head is plugging the opening of the uterus. So, provided you aren't intending on lying down too much in public, you really shouldn't worry too much about an embarrassing scene making its way onto the front pages of your local newspaper. If you do find that your waters break before you go into labour (about 15% of women experience pre-labour membrane rupture) then the first thing to remember is to stay calm. Don't get your partner in a panic trying to get two feet through one leg of his trousers in the dark, while searching frantically for the car keys and the instructions for using your TENS machine. It could be hours before you go into labour. It does, however mean that labour is on its way, and if it hasn't started naturally within 24 hours then they will probably induce it for you at the hospital. So the first thing you need to do is call the labour ward or birth centre where you have arranged to have your baby (or your midwife if you are having a home birth) and let them know that your waters have broken. They will advise you on what to do next, and generally this advice will be to stay at home for the next 24 hours or until contractions start. If you have had any complications in your pregnancy then you may have been given different advice; if this is the case then make sure you follow those orders. There is an infection called Group B streptococcus which is no longer routinely tested for by the NHS, however, some hospitals do offer a swab test to women if their waters have broken ahead of labour, in which case you may be asked to make a visit to the hospital. Even when contractions do start, you are usually not advised to go into the hospital until they are strong, regular (with no more than 5 minute intervals) and lasting around one minute each, but take the advice of your own midwifery team. Remember that if you have already delivered one or more babies then your labour is likely to be faster, so you may be advised to come into the hospital earlier. Page generated in 1.3179 seconds.